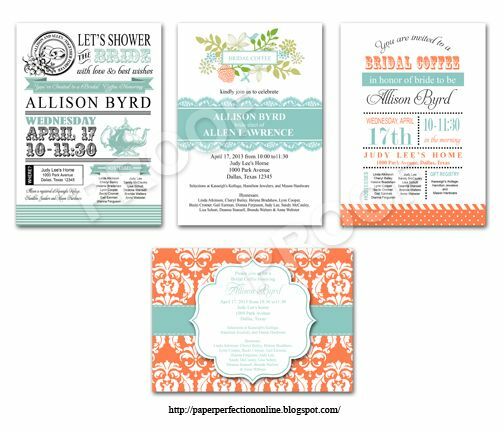 I love working with repeat customers and was recently contacted by a customer that I have worked with several times to design a shabby chic bridal shower invitation for a bride with signature colors of mint and coral. Here are a few of the designs that I created and wanted to post for others that like shabby chic designs. I can make these invites in any colors to match your event as well as make matching printables like food labels, candy bar and water bottle labels, gift tags, bag toppers and so much more. If you are interested in these designs or want a custom design for your next event contact Paper Perfection at jtanddolly@yahoo.com for pricing and details.